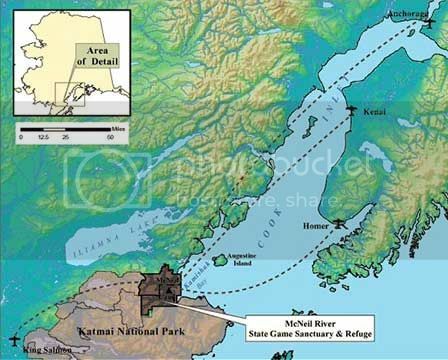 McNeil River State Game Sanctuary & Refuge is located on the Alaska Peninsula in Kamishak Bay - just north of Katmai National Park. The sanctuary was created in 1967 to protect the world's largest concentration of brown bears. When the sockeye salmon run in mid July up to 60 bears can be found at the McNeil River Falls at one time. This was our first time entering the lottery were lucky enough to win a permit to go in mid-August. The sanctuary is quieter at this time of the year (less bears) but was still worth the trip. 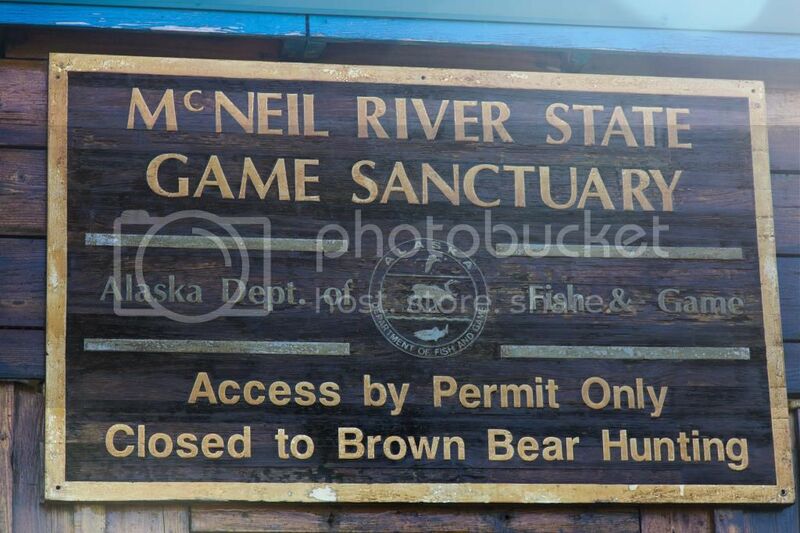 McNeil River is only accessible by float plane and there are a handful of outfits in Homer and Anchorage that are licensed to transport there. Be aware before applying for the lottery to get a permit that travel prices to McNeil can run anywhere from $750-$1000 round trip. We flew with Steller Air out of Homer and would reccomend them. The morning we were due to leave, however, weather in Kamishak was not cooperating. They were reporting high swells, that when combined with an extremely low high tide (14.5 feet) and us being right at our maximum weight (750 lbs. combined with 3 people and gear) made Jimmy the pilot very reluctant to fly. As planes can only land at McNeil during high tide, we had to wait 12 hours for the next high tide that evening. 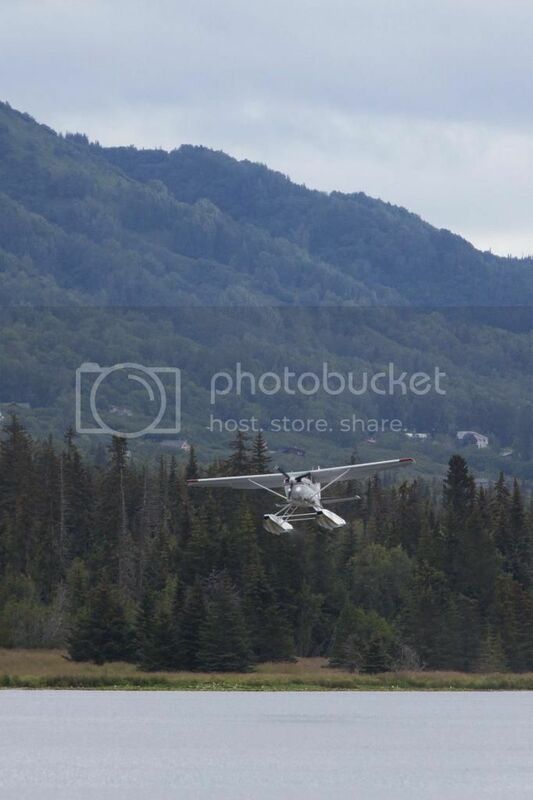 Taking off in a float plane the first time can be a little nerve wracking. The plane is small; the wings tend to dip to the left and right; and you are speeding along the surface of a lake directly at a local highway. Then when you do take off, every little bit of turbulence or movement by the pilot feels like it is about to send the entire airplane into the ocean below. That said, it was a cool experience. The trip was an hour long. Along the way, we passed by Mount Augustine (an active volcano on it's own island) and took a quick nose dive to check out a seal haul-out in the middle of the bay. Landing involves circling until the plane is going with the wind and then crashing into the ocean below. I don't think Jessi enjoyed this process, but in reality it's much smoother than one might expect. 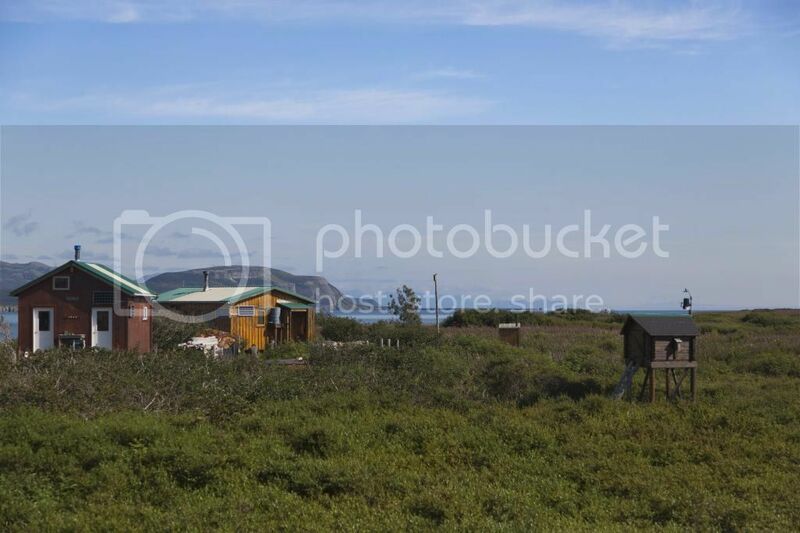 The camp itself sits on the beach near a sand spit that separates the ocean from the river mouth and creates a lagoon. 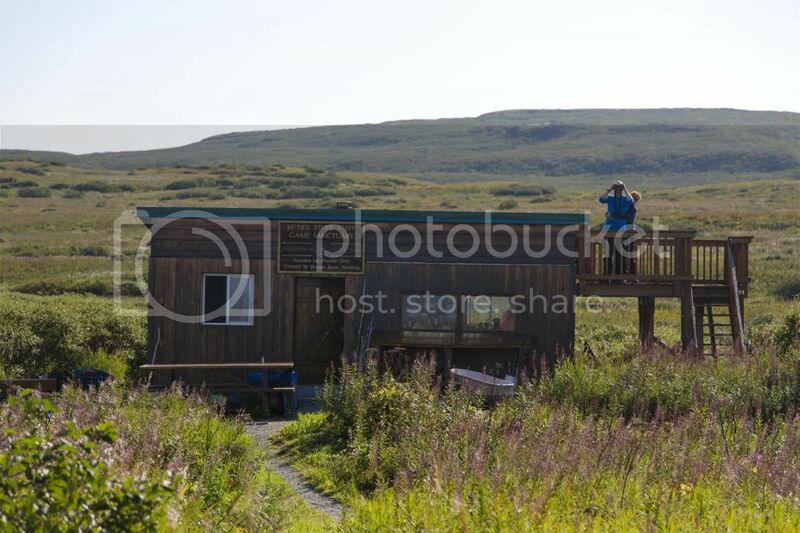 It consists of several gravel pads for tents, a couple of cabins for the guides, a sauna and a cook shack. The cook shack is where all food is cooked and stored. Keeping the McNeil bears from associating humans with food is the most important focus of the guides who run the sanctuary. The sauna at the camp is an amazing addition allowing one to clean up after a day of hiking through streams, lagoons and mud. The camp rat of the day always had the fire going and the water hot by the time we got back to camp from bear viewing. In front of the bath is the sauna pond. 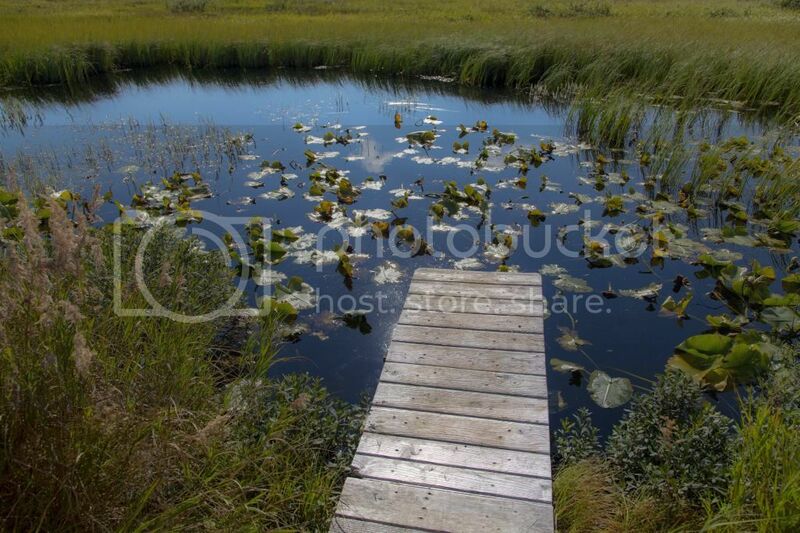 Now the deck is not to be used as a diving board, as the pond is in fact quite muddy, but as a way to gather water for the sauna. Permits are given out for four day stretches - but stays at McNeil are usually 6 days and five nights including fly in/fly out days. Accomodations are whatever tent you bring with you (and you want to bring something that can stand up to bad weather and high winds). 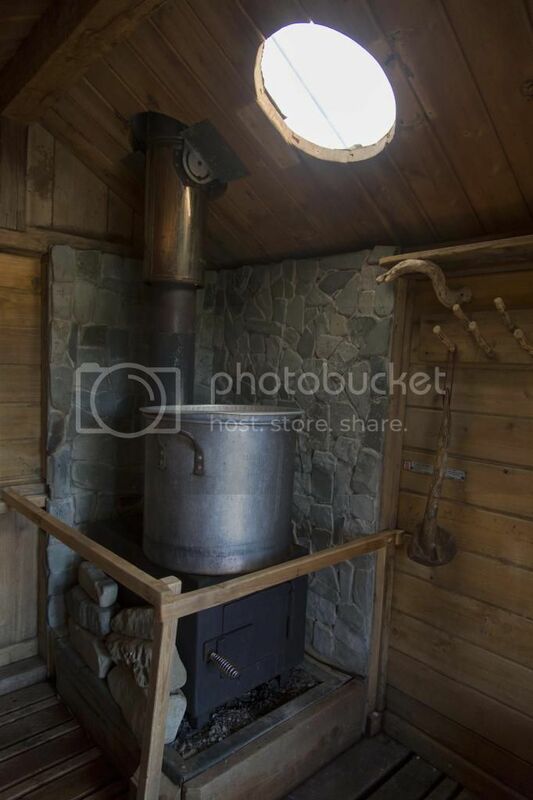 However, the cook shack and sauna make the stay seem downright civilized when put in perspective that the nearest community is King Salmon (population <400) 90 miles away. Of course, the reason to come to McNeil is to view the bears and during a stay the guides will do their best to help visitors locate and admire the locals. Adventures in muck slogging and lagoon wading in search of brown bears will be coming up soon in Part II on McNeil River. Last Great Race on Earth 4! Last Great Race on Earth 3! Last Great Race on Earth 2! The Last Great Race on Earth!